Short version: A solid pair of laptop or desk speakers, unremarkable but warm and powerful, with an understated and attractive design. More attention to detail would help justify their price, though. When it comes to PC speakers, the go-to brands like Harman-Kardon, Klipsch, Logitech and so on provide good, predictable performance. I saw these speakers announced a little while back and felt it’d be good to take a break from the usual suspects. I’m glad I did — Audyssey’s LES speakers aren’t a knockout or anything, but they hit a nice Goldilocks zone of size, power, and fidelity. The design is meant to evoke the Lower East Side of Manhattan. I’m not sure how or why, but whether you see that neighborhood in the speakers or not, you can at least agree that the design is straightforward, handsome, and understated, perhaps to the point of being plain. The speaker enclosure itself, with its red rubberized stripe gripping the one-piece stand, is nicely done and reassuringly speaker-shaped. The stand, while sturdy and partially rubberized, doesn’t seem as considered. 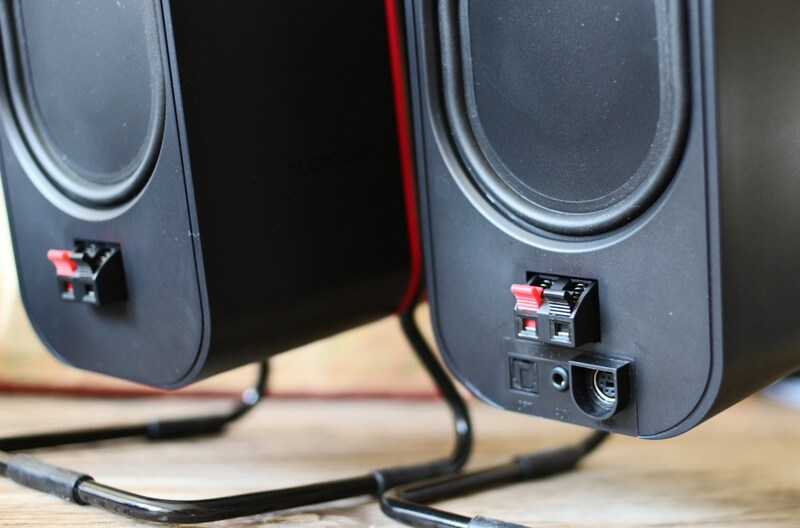 On the right speaker you have a red/green power indicator LED, a 3.5mm headphone jack, and the volume knob, which you press to power the speakers on or off. The indicator is tastefully dim and of an olive hue, not the traffic light green often found on devices. I was not impressed with the quality of the volume knob: there’s very little weight to it, and lots of wiggle. And the volume level notch is so shallow as to be nearly imperceptible most of the time. They have 3.5mm and optical audio input on the back, and the speakers connect with standard speaker wire. Might have been nice to see something more substantial as a connection method. As you have no doubt figured out by now, this is a two-speaker setup, not 2.1. Normally two-speaker systems are budget items, given away with cheap laptops or plugged directly into your iPod. 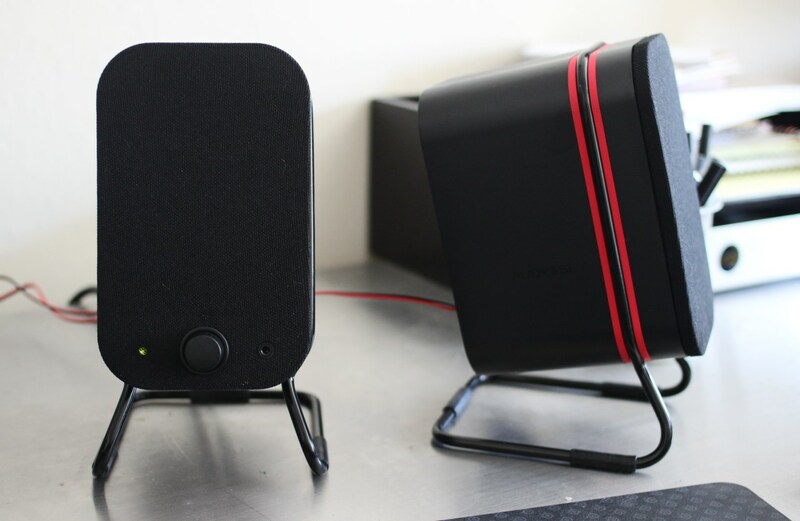 The LES speakers are different, more like bookcase speakers on your desk than anything. They’re powered, with decent-sized drivers; Audyssey claims “Small speakers that can’t produce bass, speaker cabinets that make noise, distortion, or even poor sound quality at low volumes are all problems that are solved by Audyssey Smart Speaker technology,” and “We don’t boost the bass and distort the sound, we actually enhance the performance of the driver to give you deeper sounds.” They won’t be blowing your windows out or anything, but it’s safe to say they’re well beyond the capabilities of your average two-speaker set. I actually prefer these over the Logitech Z623s I recently reviewed, which sound great, except I’m always worrying about whether I’ve got the sub at the right level — and at any rate, separating the low end into a separate channel has always kind of bothered me, though it’s really only a problem when the falloff between the satellites and the sub isn’t well thought out. The LES speakers have a nice level response throughout the spectrum, and while you won’t be getting teeth-rattling bass, that’s not really the intention of compact speakers like these. Some experimentation led me to the discovery that these speakers sound best on a flat EQ, or something close to it. Depending on what you’re listening to, you might want to bump or scoop it a little bit, but for the most part they produced an even, rather warm sound that easily reached up into the highs and descended into lows without distorting or falling off too much. If anything I felt that a certain bit of mid-low spectrum was overemphasized, taking over the rest of the sound during this or that part of a song, though I’m starting to think that’s a resonance issue with my desk. At any rate I don’t have the same issue with other speakers. They get plenty loud, though the sound is fairly directional and you’ll want to stay in the sweet spot if you can. Movies and games sounded good. One quirk I wish Audyssey had thought twice about is the auto-off feature. If you don’t use the speakers for a while, they turn off automatically. No problem, you think, saves a little power. But they don’t turn back on when you come back and hit play again. I know, it’s a small problem to have to hit the button and turn them on, but I wish they’d just implemented an auto-on feature as well. I also think that treble and bass adjustment knobs wouldn’t be out of place. I know you can EQ stuff, but it’d be nice to do that on the back of the speaker as well for when they’re in a less customizable audio environment. For apartment living or use in, say, a studio environment, these are a great choice. Or for a dorm room, where space is at a premium and subs just irritate your neighbors. They’re tastefully if not beautifully designed, produce good sound with plenty of power, and provide a simpler and perhaps more faithful audio environment than 2.1 setup. If you’re confident enough to tweak your sound a little so it’s sending the right stuff to these, I’d say they’re a great choice for personal audio. But I hope they’ll consider paying a little more attention to the user experience details in the next version.